Artwork Panel: 52.8cm x 98cm ≈ 20¾" x 38½"
This depicts an old man enjoying a fishing trip. 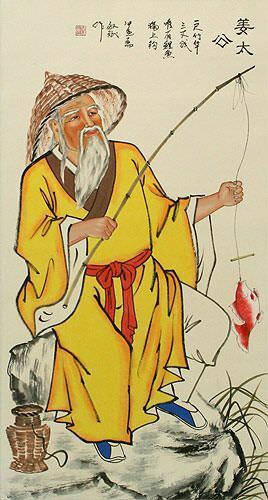 The title does not say so, but this old man is probably Jiang Ziya sometimes known as Jiang Tai Gong of the famous idiom. The artist's name is Qing Jing-Bin. He was born in Guanxi Province (southern China). His specialty is paintings of mythological and historical figures of ancient China.